High-Performance Manufacturing: Portable Production Skills, authored by the Manufacturing Skill Standards Council (MSSC), will raise the technical, academic, and employability skill level of tomorrow’s workforce as students and incumbent workers learn core production skills. High-Performance Manufacturing meets the MSSC Production Skill Standards, addressing core skill areas of 14 manufacturing subindustries. 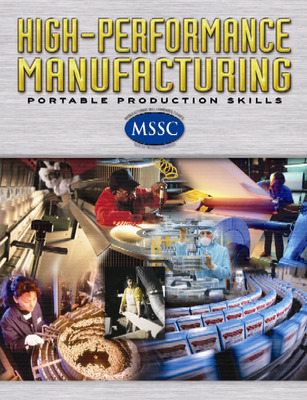 High-Performance Manufacturing: Portable Production Skills, authored by the Manufacturing Skill Standards Council (MSSC), will raise the technical, academic, and employability skill level of tomorrow’s workforce as students and incumbent workers learn core production skills. High-Performance Manufacturing meets the MSSC Production Skill Standards, addressing core skill areas of 14 manufacturing subindustries. Communication features address ways to develop speaking, listening, writing, reading, and social skills. Information Technology features explain how to use information and communication technology and gather and analyze information in the workplace. Math & Science features explain essential math and science skills used in manufacturing. Teamwork features showcase real teams at work, building consensus, and adapting to various situations. Leadership features describe real-world examples of leadership, organizing and planning, and career development. Problem Solving features describe ways to analyze and solve problems in the manufacturing workplace.